Cheng Man-ching (Chen Man-ch'ing, Zheng Manqing), born July 29, 1902, Yongjia, China – died March 26 1975, Taipei, Taiwan, is one of the greatest taijiquan (t'ai chi) masters and teachers of the 20th century. He was the creator of the enormously popular, of what he titled, the "Yang-style t'ai chi in 37 postures"; as well as instrumental in introducing taijiquan to the United States. A man of the Chinese "Five Excellences" he was also a widely respected painter, calligrapher, poet, and practitioner of Chinese Traditional Medicine. He taught painting at the Peking Academy of Fine Arts (1923), and established the College of Chinese Culture and Art in 1930. 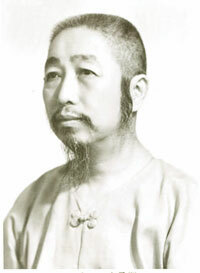 He began practicing Traditional Chinese Medicine in 1936 until his death in 1975. Cheng Man-ching's name is also spelled Cheng Man Ching, Cheng Man-ch'ing, and (in Pinyin) Zheng Manqing. In Traditional/Simplified Chinese script it is (鄭曼青/ 郑曼青). He was called "Professor Cheng" by his students. From 1930 to 1936 he studied taijiquan with the famous Yang Chengfu. He created his 37 Posture Short Form in about 1938. During the Second World War he taught taijiquan at the Central Military Academy (formerly the Huang-po Military Academy) the Chinese equivalent to West Point in the United States). He moved to Taiwan in 1949, and started the Shih Chung T'ai Chi Association in Taipei in 1951. In 1964, Cheng with his wife Juliana Ting Cheng, and their two sons, and three daughters moved to New York City where he taught in Chinatown at the T'ai Chi Association at 211 Canal Street where he encountered stiff resistance from the Chinese community for teaching non-Chinese people. He then founded and taught at the Shr Jung T'ai Chi school at 87 Bowery. Many of his students in New York and in Taiwan would go on to become famous teachers themselves. He died in Taiwan March 26, 1975 of a cerebral hemorrhage. He wrote extensively. A bibliography of his writings is at "Cheng Manching books (written by him, his students & other[s])"
Cheng Man-ching's daughter described her father this way: He lived a simple, thrifty, but fruitful life. He managed things with order. He never envied nobility; never craved for fame or profit….He maintained that one's stature rests with one's inner worthiness, and he always felt satisfaction from everything, together with a grateful heart. [Katy Cheng. "My Father"]. Cheng Man-ch'ing Biography Project information. Cheng Man-ch'ing. Master of Five Excellences; translated by Mark Hennessy. Frog Books/North Atlantic Books, 1995. Cheng Man Ching. The Master Tapes. [four hours of video]. Wolfe Lowenthal. There Are No Secrets. North Atlantic Books, 1991. Alden Whitman. "Man-Ching Is Dead at 73; Calligrapher, Painter and Poet." New York Times, April 5, 1975.